October 25, 2018–(BRONX, NY)–By incorporating a gene-suppressing drug into an over-the-counter gel, researchers at Albert Einstein College of Medicine and their colleagues cut healing time by half and significantly improved healing outcomes compared to control treatments. Results from the combination therapy, which was tested in mice, were published online today in Advances in Wound Care. "Not only did wound healing occur more rapidly and completely, but actual regeneration occurred, with hair follicles and the skin's supportive collagen network restored in wounded skin–clinically important improvements that are unprecedented in wound care," says senior author David J. Sharp, Ph.D, professor of physiology & biophysics at Einstein. "We foresee this therapy having broad application for all sorts of wounds, from playground cuts to battlefield injuries to chronic wounds." In the current study, Dr. Sharp enhanced the siRNAs' wound-healing potential by combining them with PluroGel–a protective gel that keeps wounds moist and has antimicrobial properties when applied to bandages and other wound dressings. In addition, Dr. Sharp incorporated the siRNAs into microparticles made of collagen, a naturally occurring protein that readily releases its siRNA "cargo" after coming in contact with the skin. "These results show that FL2-siRNA plus PluroGel is a highly promising wound treatment," says Adam Kramer, a Ph.D. candidate in Dr. Sharp's lab and co-lead author. "By lowering FL2 levels in skin cells, the FL2-siRNA helps cells reach wound sites much faster than they ordinarily would–essential for minimizing scarring and preventing wounds from becoming chronic. And by hydrating wounds and inhibiting microbes, PluroGel offers important additional wound-healing benefits." 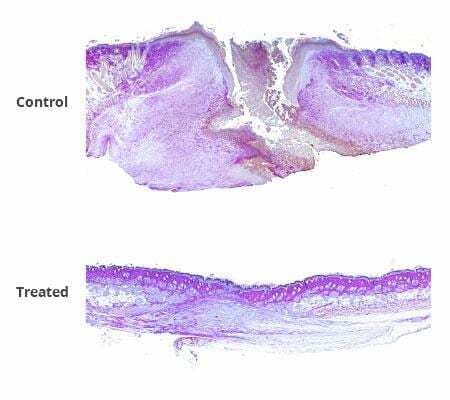 Dr. Sharp and Brian O'Rourke, Ph.D., the paper's co-lead author and chief scientist at MicroCures, Inc., have achieved similar success in treating skin wounds in pigs–animals with skin that closely resembles human skin. Dr. Sharp's team plans to seek permission from the U.S. Food and Drug Administration to test their wound-healing therapy in clinical trials.